The modern flag seen by Jonathan is less interesting, but it is used and it should also be drawn. I wonder, however, whether the background colour is actually black. I *think* I have seen photos which show it as a deep purplish colour, and the image at www.flickr.com/photo_zoom.gne?id=36890807&size=o doesn't look black to me. There are also regional variants of this flag in other colours, which I don't think need concern us much, as at http://news.bbc.co.uk/1/shared/spl/hi/pop_ups/04/uk_east_midlands_summits_and_low_points/html/1.stm. The typeface for the three letters, B,B,C, is Gill Sans, the type designer and sculptor Eric Gill having carved the statue of Prospero and Ariel which is on the front of Broadcasting House. I have also found a reference to a BBC flag at http://clarkphotos.spaces.live.com/, where a 'green BBC flag' was flying from the launch which was covering the Oxford and Cambridge Boat Race. I may have seen a photo of this, but I don't think it's important, being the same sort of one-off as the flag reported by Ron Lahav which started off this thread. I recall seeing a dark blue flag with the whole achievement of the BBC's coat of arms on it at a trade show in the mid 1990s. I will try to see if I can find a photograph. I completely agree about that photo, and others I have seen online. However, I saw the flag again, and it definitely appears blacker than the online photos. There is also another variant of the flag with the words "WORLD SERVICE" in white on two lines below the squares and without the red-green-blue strip at the top (which to me seems to focus on TV/internet to the exclusion of radio), as seen in this photo: http://www.flickr.com/photo_zoom.gne?id=371789784&size=l. 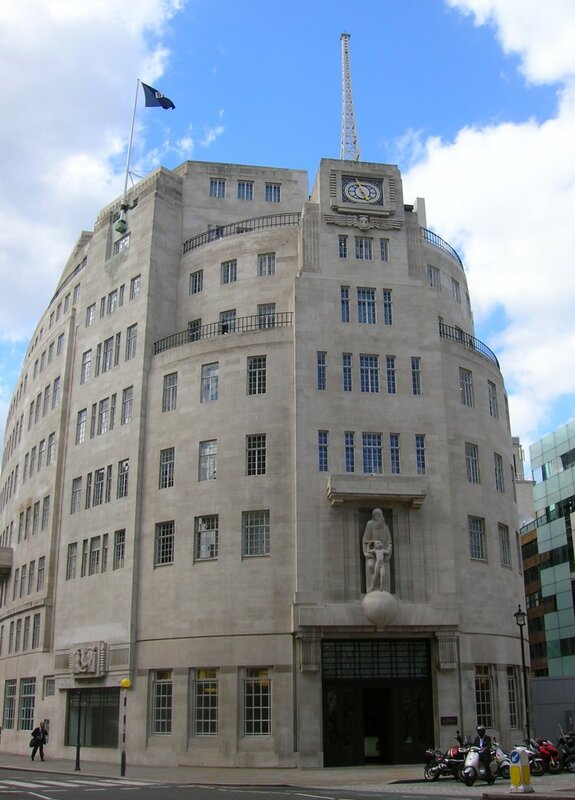 I found two nice pictures: http://upload.wikimedia.org/wikipedia/commons/a/a1/Bbc_broadcasting_house_front.jpg (flag on top of the Broadcasting House, HQ of the BBC Group) and http://www.telegraph.co.uk/culture/tvandradio/6140915/BBC-an-institution-to-be-proud-of.html (zoom on the previous image). Here are some more photos of BBC flag. Dark blue version: http://cache.daylife.com/imageserve/01qweNU6apf1b/610x.jpg. Red (orange) version: http://www.flickr.com/photos/suchnone/2178457880/. White version: http://i.dailymail.co.uk/i/pix/2009/04/26/article-0-049F1D7F000005DC-2_634x353.jpg. Notice the red-blue-green color stripe on first two images. On blue flag stripe is on top of the flag and on red flag stripe is on bottom of the flag [editor's note: this flag is actually being flown upside down!]. "A terrestrial globe on an azure field, representing the ether, with the seven remaining planets in the sky around it. Around the globe is a golden ring representing broadcast transmissions through the ether encircling the earth." I don't think this symbol is still in use, but I did see a flag flying at Broadcasting House the other weekend. It was black, with the BBC logo (three squares containing the letters B, B and C) in white, and a narrow strip along the top divided red, green and blue. The BBC as an organisation started in 1922, as the British Broadcasting *Company*; it was then a consortium of manufacturers of radios - 'wireless sets' in the language of the time. In 1927, it became a public corporation established by Royal Charter, and John Reith, who had been the General Manger, became its founding Director-General (and would later become Sir John, finally Lord Reith). The flag described in the 'Time' article is the banner of arms derived from the coat of arms granted to the BBC, apparently in 1927 on its incorporation. This is reported in the Wikipedia article at http://en.wikipedia.org/wiki/Coat_of_arms_of_the_BBC, and at an interesting and, I think, convincing site at www.btinternet.com/~roger.beckwith/bh/odds/crest.htm, though I cannot find direct evidence for the date of the grant of arms. It would be wonderful if the College of Arms could make their records available on-line, though I see they now have on-line versions of their newsletters ( www.college-of-arms.gov.uk/#newsletter ) which include vexillologically relevant material. The website at www.btinternet.com/~roger.beckwith/bh/odds/crest.htm comments on the changing appearance of the coat of arms over the years, but the author is clearly not very familiar with heraldry, since the changes are purely artistic licence and the blazon is respected. There is one exception to this, however; for some years the motto changed from "Nation shall speak Peace unto Nation" to "Quaecunque". It is alleged both here and at Wikipedia that this happened for unknown reasons in 1934, but I had always believed that it changed when war was declared - or, at least, was seen as inevitable - in 1939. I haven't found any evidence either way (but I don't have time to read all my books!). However, for vexillological purposes, this is secondary, since the motto does not appear on the flag. The image above is based on a BBC television programme about the history of the Third Programme, the BBC's 'cultural' radio channel which started after World War II. It shows the flag flying on Broadcasting House, Portland Place, London. Versions of the coat of arms can be found at www.blogstudio.com/johncoxon/03_02_03___03_08_03_Mind_Streaming.html, www.tech-notes.tv/Links,%20Publications%20&%20Organizations/links_to_other_places.htm and http://news.webshots.com/photo/1093559488038922344iNYvfA. The colours vary, but I believe that the blue isn't as vivid as some of these and should be B- (51:153:255). A 'clean' line version of the arms can be found at www.flickr.com/photos/69174225@N00/39215481/. Note that on the flag, the seven 'stars' are arranged as a vertical line of three on each side with the seventh at the top. Boutell's Heraldry (Rev. Ed. 1963) shows the coat of arms on Plate XXIV between pp. 226 and 227: what we call stars are "estoiles" (seven in all, each having six wavy rays). "The gold band represents broadcast transmissions" (p. 226) actually touches the globe, surrounding it like an annulet. Other coat of arms elements I leave out as they do not appear on the flag. The arms were granted in 1927. 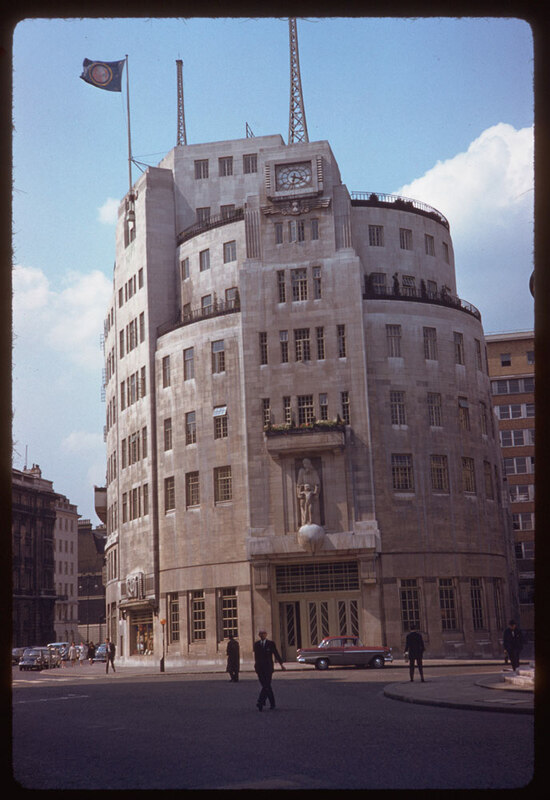 Looking at an online picture archive from Charles W Cushman (Indiana University Archives) (http://webapp1.dlib.indiana.edu/cushman/index.jsp), I came across a picture taken on May 30, 1961 of the Broadcasting House Langham Place, the Main Office of the BBC (http://webapp1.dlib.indiana.edu/collections/cushman/full/P12194.jpg). It shows a flag, which I guess was the old BBC flag. It shows a dark blue flag. center are two orange ellipses (this is really not very precise - they resemble nothing more than Salvador Dali's melting clocks). These ellipses are apparently the symbols of BBC News now, as they appear at the beginning of all news broadcasts on at least four regular newscasts: the hourly and half-hourly news updates on BBC News 24, the 24-hour news channel, the Morning News, from 6 to 8 a.m., the Six o'Clock News, and the main evening newscast at 10 p.m. In the space between these ellipses there are three small five-pointed gold stars in an irregular formation, with a larger five-pointed gold star below. To the right of the artwork are the words in white italics 'BBC News', in two lines. The Beeb should be congratulated for actually devising a flag of genuine vexillological content instead of using the traditional logo on a bed-sheet of so many news organizations. 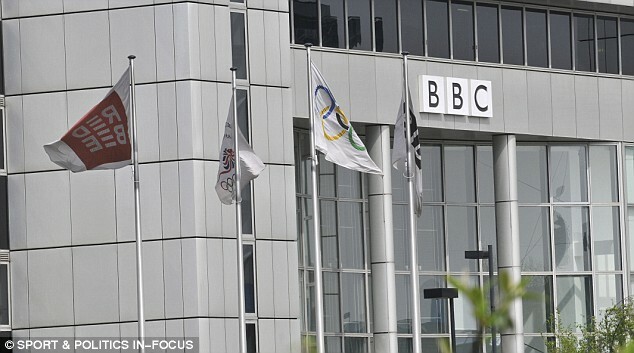 Note that this flag differs from that of the BBC as an organization.